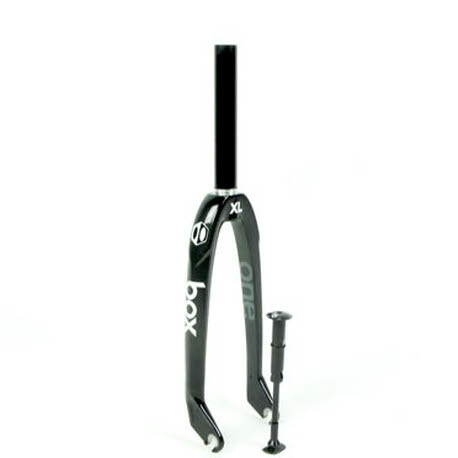 The BOX X Series line of carbon fiber forks is the newest evolution of their design thinking. X Series forks are built in one of the world’s leading carbon fiber frame and fork factories using the latest manufacturing techniques and materials. They feature all-carbon crown and leg construction paired with precision cold-forged and CNC-machined drop outs. XL (Expert 1 1/8 inch): This is the same as the “X”, but with a 1 1/8″ 7075 aluminum alloy steerer tube. They also feature standard size carbon legs with a full-carbon crown and 10-millimeter dropouts. X-10 (Pro-Lite): This is the same fork as the “X”, but it has 10-millimeter dropouts. They also feature standard size carbon legs with a full-carbon crown and a 1 1/8″ chromoly steerer tube. They come in 20″ model. XE (Expert 1 inch): This is our Xpert fork. They feature standard size carbon legs with a full-carbon crown, a 1″ 7075 aluminum alloy steerer tube and 10-millimeter dropouts. They come in 20″ model. XS (Mini): This is our Mini model. They feature smaller carbon legs with a full-carbon crown, a 1″ 7000-series aluminum alloy steerer tube and 10-millimeter dropouts. They come in 20″ model. X Series forks are for racing only and not meant for freestyle riding. Your X Series fork should be installed by a professional bicycle mechanic.